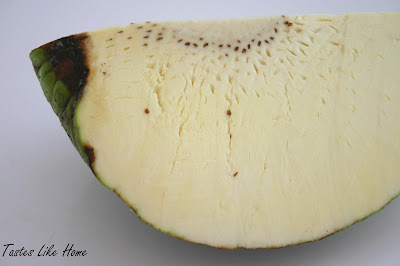 tastes like home: How do you like your Breadfruit? 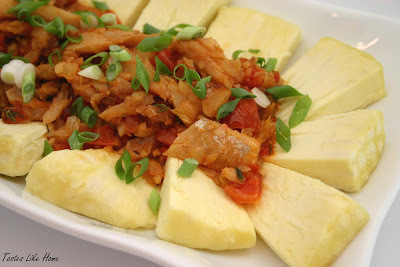 How do you like your Breadfruit? 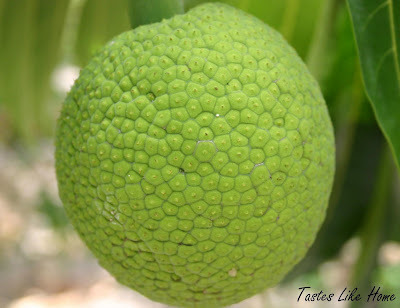 This week’s column is all about the versatile breadfruit. It can be roasted, fried, boiled, mashed, creamed, pickled, sautéed, candied… and I’m sure that you will be able to tell me more ways in which this fruit can be prepared. 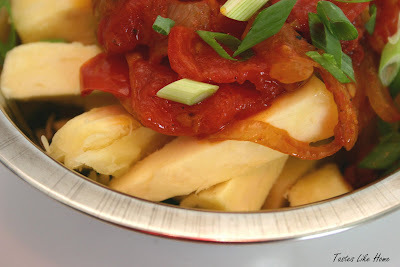 One of my favourite ways to have breadfruit is sliced thinly and fried. It makes a quick delicious snack that can be spiced in a variety of ways. For this post however, I have done a simple spicy sprinkling of freshly cracked black pepper and coarse sea salt. It can be sliced thicker if you like. I used a mandoline to slice mine. One of the more popular ways to eat breadfruit here is to boil it, slice it and serve it with sauteed saltfish, tomatoes, onions, and herbs. Many Many people, particularly in the Eastern Caribbean islands would prefer this dish to chicken, pork or other meat dish.